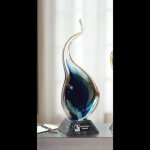 Proudly handcrafted in America, this exquisite glass sculpture stands tall at 21" x 8" x 3 1/2" on a marble base. With its unique flame shape, elegant curves, and mesmerizing mix of blue hues inside a clear outer layer it is sure to be the perfect addition to any desktop. 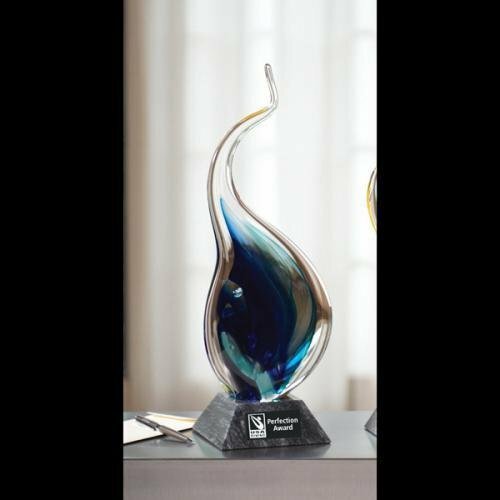 With a 2 1/2" x 6 1/4" x 6 1/4" base, customize your award by having the message or name of your choice lasered into the marble base Item is not attached to its base.